Balance Training for Surf, SUP, Wakeboard, Kiteboard and Board Sports. Core Strength Exercises for Surf Sports and Learning Balance. The Best Balance Board for Kids and Learning How to Surf. Taking up a new surf sport and planning a surf vacation? Get our special designed Surf Starter and enjoy your next session by being prepared. We shaved weight off the nose to carve a turn with quicker precision compared to our elliptical models. The stable fish/swallow tail keeps your base grounded as you whip this board in, out and around. Get the most out of your first surf lesson by training your balance and leg endurance. The large ride surface and small rail is ideal for growing kids and beginners. Progress your ride skill and ride stance until you find your comfort zone. When ready you can expand this rail by 8" inches and continue to push the limits. Pop-ups, switch foot, fancy footwork, smooth glassy surface, rough water conditions, aerial grabs and cutback power training is all possible. 3" Mini Balls: These are the smallest Balls and are very quick and responsive. They will keep you close to the ground for an easy stop for beginners. Riding on one ball forces you to stay level. Using two balls is better for footwork training. If using on an extremely padded surface or deep carpet these balls will be absorbed and limit your ride motion. Use two balls to create a double pivot board and then progress your skills to one ball. 5" Half Balls: These small Half Balls are the perfect beginner size that will create a challenging surface. Perfect for and kids progressing to this board. Use two for a basic rocker board or one for a wobble board tilting in all directions. Half balls allow you to progress from the basics of balance or multi-task in complex motions as you progress. 6.5" Half Balls: This size Half Ball is great for kids who need the added height for range of motion. You will be able to rotate the balance board better with this size. Use a 3" Mini Ball and 6.5" Half Ball for the Thrasher and Rock and Roll combos. Use a 5" Small Ball and 6.5" Half Ball for the Big Drop combo. 8.5" Half Balls: Ultimately this is the best size for adult riders who have good range of motion and want to practice stability on each foot. This Half Ball puts you up nice and high to work on rotation training without grounding the board. Use a 5" Small Ball and 8.5" Half Ball for the Rock and Roll and Thrasher combo for rough water training. 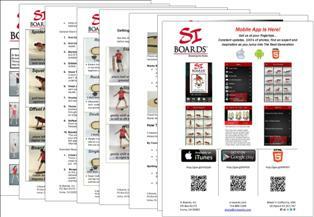 Most new Si Boarders chose this board because they want to learn how to surf or want to stay in shape between sessions. Many added the 8" rail extensions to get a wider stance. I love this board for the large ride surface and small compact rail. It stores easily and fits into bags for travel. I know I can train a variety of users in full body moves and rotational control.